Last weekend Linda and I had a wonderful time in Louisville, Kentucky at the Derby City Comicon! On our arrival late Friday night we were very happy to run into unofficial greeter Larry Hama in our hotel lobby and the later Linda and I took a walk to find a place to eat. There we found Chicagoans Sean Dove , Mike Norton , and Timothy Seeley . At the show we enjoyed meeting attendees and fans from a part of the country that we've never been to. A local said, "While you're in Louisville you have to try the Hot Brown!" At the show Dennis Calero asked if we'd like to go out to dinner with him, Karissa Johnson, Rodney Ramos, and Matt Triano . There we were also joined by Steve Scott. It was a fantastic time and great conversation. A lot of shop talk but also a lot of laughs! The next day before leaving Linda and I took a walk through the city admiring some of the great architecture. I'll post a few favorites. We drove to the show but really enjoyed the trip through Kentucky, Indiana, and Illinois. Thanks again to Eric Banister for the invite and being such a great host! The trip my wife Linda and I took to France earlier this month was amazing! We visited many sites in Paris and of course a big highlight was the Louvre Museum! We could have spent a week in that historic place! Later we were driven by our host to the city of Lyon for our appearance at the comic shop "Comics Zone" owned by Kader Chaibi . A shop that specializes in American comics. I never imagined such a place existed in France. We had a lot of fun meeting fans of American comic art doing more sketches than I can count! Lyon is a beautiful city. Wonderful architecture and also houses a lot of great art at the "Museum of Fine Arts of Lyon" (Musée des beaux-arts de Lyon) including 19th century French paintings by Monet, Delacroix, Gauguin, Van Gogh, etc. I'll post pics and art soon from our spectacular adventure! In early 2012 I did extensive on screen art BOOMSTICK FILMS Horror/Comedy DOCTOR SPINE! Written and directed by John Wesley Norton. DOCTOR SPINE stars Michael Wexler, Larry Thomas, Joe Estevez, Reggie Bannister, Jen Schmidt, Kris Desautels, Cyn Dulay, Renee Domenz, Xango Henry, Judy Tenuta, Lisa Loring and many others. 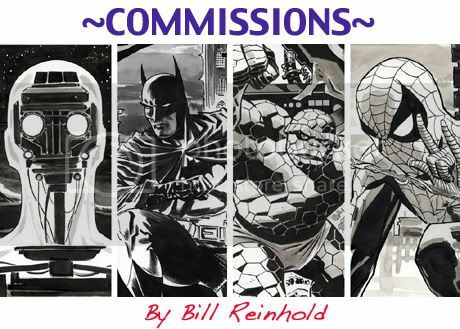 I'm planning my 2012 schedule so if anyone can use the art skills in penciling and inking of Bill Reinhold keep me in mind for the upcoming year! for many great examples of comic art I've been part of through the years. Commissions fortunately are pretty full up right now but anyone interested can still be put on my list for when time opens up. One of my very favorite (if not favorite) comic and newspaper strip artists is FrankRobbins! If you already love Robbins take a look and if you don't know it PLEASE take a look! Enjoy! I've posted about this work before, but FINALLY John Wesley Norton's award winning Horror/Comedy "DOCTOR SPINE" has been released and can be in your hands! I illustrated the DVD cover and other art used throughout the film. The movie stars Joe Estevez, Larry Thomas, Michael Wexler, Reggie Bannister, Jen Tor Chia, Kris Desautels, Cyn Dulay, Renee Domenz, Xango Henry, Judy Tenuta, Lisa Loring and many more! Van Helsing vs. Jack the Ripper T2 Published! I'm very excited to announce that finally my graphic novel ~Van Helsing Vs. Jack the Ripper Vol. 2 The Belle de Crecy~ (Van Helsing contre Jack l'Éventreur T2 - La Belle de Crécy Relié ) written by Jacques Lamontagne was released TODAY (Jan. 21, 2015) by the French publisher Soleil Productions ! **Van Helsing vs. Jack the Ripper T2 Published**Van Helsing vs. Jack the Ripper T2 Published! Earlier in the fall I finally finished the graphic novel ~Van Helsing Vs. Jack the Ripper Vol. 2 The Belle de Crecy~ (Van Helsing contre Jack l'Éventreur T2 - La Belle de Crécy Relié ) written by Jacques Lamontagne to be published by the French publisher Soleil Productions in Jan. 2015. Earlier in the fall I finally finished the graphic novel ~Van Helsing Vs. Jack the Ripper Vol. 2 The Belle de Crecy~ (Van Helsing contre Jack l'Éventreur T2 - La Belle de Crécy Relié ) written by Jacques Lamontagne to be published by the French publisher Soleil Productions> in Jan. 2015. Last weekend Linda and I had a wonderful time in Louisville, Kentucky at the Derby City Comicon! On our arrival late Friday night we were very happy to run into unofficial greeter Larry Hama in our hotel lobby and the later Linda and I took a walk to find a place to eat. There we found Chicagoans Sean Dove:iconLimnus:, Mike Norton:iconmiketron2000:, and Timothy Seeley:iconColtNoble:.